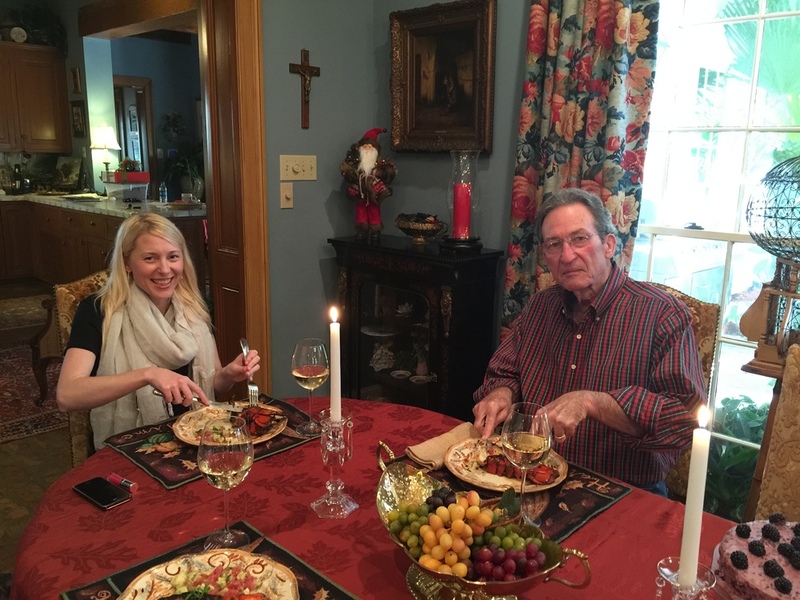 For the last thirty plus years, Thanksgiving has been a time when my home was filled with family and food. Enjoying each others company and sitting down to celebrate a traditional Thanksgiving dinner which usually included all the standard favorites; tossed green salad, cornbread or oyster dressing, sauteed green beans, sweet potato casserole and an assortment of cakes and pies was the routine. Typically, my table preparation and meal would take two days to complete, with chaffing dishes assembled, cake stands cleaned, silverware polished, crystal washed, table arrangements made, groceries bought, etc. In the past, I loved the challenge of making this special time "perfect" but I have to confess my husband, Pete, was always the "key" to making the event a success. He corrected or camouflaged many cooking snafus all while having to withstand my overbearing, dictatorial attitude telling him what needed to been done. With his gracious style, our dinners were always enjoyed by everyone. 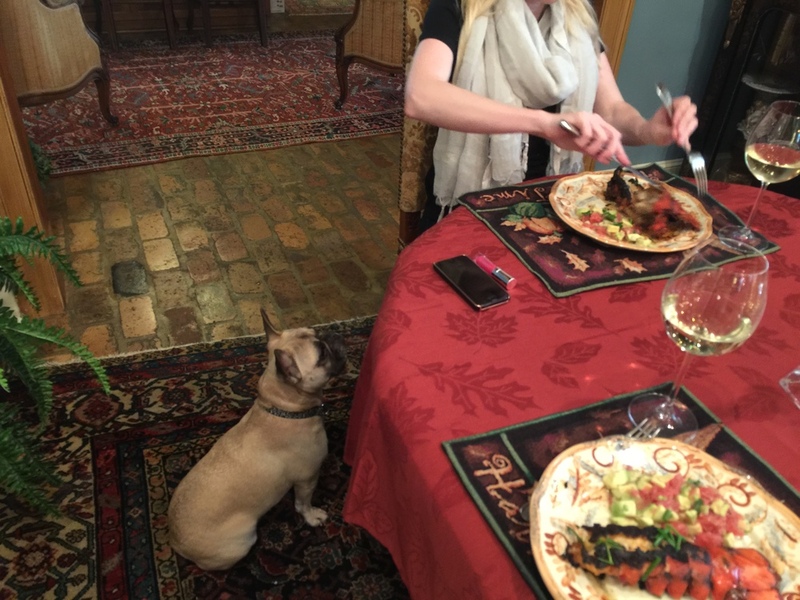 Thanksgiving 2014 was different. Only my daughter, Cosima, and my "granddog," Sophie, were here for the holiday. Since it was just the four of us, Cosima decided she would prepare the dinner. My husband and I were pleased she wanted to do the cooking. We asked her what she had in mind and she replied, "Something untraditional." Being particular about what he eats, he tried to insist she get a "Honey baked Ham" and a red velvet cake, two standards he loves that he knew he could count on to satisfy his Thanksgiving dinner desires. She balked and said, "We're an untraditional family. So, I am going to prepare an untraditional Thanksgiving dinner." In a relaxed, organized manner, Cosima started preparing the meal at mid-morning and was done by 2:00pm. I set the table in five minutes and the only task my helpful husband had to do was cork the wine bottle. Our surprise menu was as follows; a hatch chile feta dip with gourmet crackers, avacado and grapefruit salad, grilled lobster tails with sriracha butter and a "to die for" blackberry and lime cake, complimented with a New Zealand sauvignon blanc wine. My daughter found all the the recipes on Pinterest, something I know nothing about but need to learn. The meal was delicious and light. We had "just enough" to eat. Need I say more; you get the picture. Thankful for my many blessings and thankful for this "Untraditional Thanksgiving Dinner!"